Jun 12 It is 1989. This is the last time I will call Moscow, home. I am two years old. 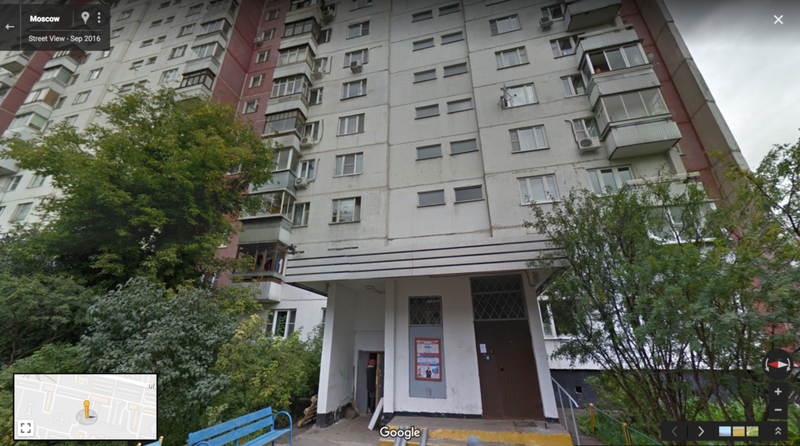 I'm with my parents, Igor and Elena, standing in front of our Zhiguli, near the entrance to our apartment on Ulitisa Berzarina in Moscow, Russia. This is the apartment building today. HERE'S WHAT I KNOW IN THIS MOMENT. I know there is a sandbox "pesochnitsa" in the courtyard "dvor", where all the neighboring building's kids come out to play. I know that my neighbor is a girl who likes to play with me in the sandbox. Her name is Alina. I know that I am holding "minka dinka" which is my nickname for my bear. I know that I like to eat kasha and I like to drink milk. I know that I am loved. HERE'S WHAT I DON'T KNOW IN THIS MOMENT. My bear is actually a bunny. When we move to North America, I will lose my bunny and I will cry. I will miss my friend. To ease my pain, I will be gifted a teddy bear. His name will be "Meenya". He will continue being my bear for a long time. My neighbor will eventually become one of my closest friends. Her mother, will become my God Parent. I will love her dearly. Alina and I will fight over her stuffed animals as kids. Particularly, a pig, which she won't want to share with me. We will obsess over 90's pop music, studying every dance sequence Britney Spears performs in her videos. We will see each other over the summers when my family visits Moscow. We will share our insecurities over our crushes. We will sit at a cafe when we're older. I will tell her about my failed relationship with the first boy I loved. She will tell me she met a man. She will marry this man and move to the United States. She will be the first of my friends to be pregnant. I am overwhelmed with joy when I put my hands on her pregnant belly. She will have a girl of her own. Her girl likes to dance, just like she did as a child. My Mother is 25 years old. She is smiling. She doesn't know that moving to a foreign country will be difficult and lonely. She and I will become very close because of this. She is wearing an outfit my Father bought her during his many trips out of the country. At the time, this was an extreme luxury. So was our car. So was our one-bedroom apartment. We will have a TV production crew come to Moscow from America. They will want to interview my Father as we prepare to move to Canada. They will ask which room to set up their cameras. My parents will tell them that the current room they're in, IS the only room. They will be amused. My Father has already won two Olympic Gold Medals, two World Junior Gold Medals, four World Championship Gold Medals, and Gold at the 1981 Canada Cup. He has finally been granted permission to leave the Soviet Union, free to leave the Red Army team and to sign a contract with the Vancouver Canucks. He is 28 years old. He will go on to win three Stanley Cups with the Detroit Red Wings. He will bring the Stanley Cup back to his hometown, Voskresensk. He will be inducted into the Hockey Hall of Fame. He will retire from the NHL at 42 years old, entering The Triple Gold Club. This will be my first move out of many more to come. At first difficult, moving will become easy. It will be the only constant in my life. I will learn how to make friends quickly. My meaning of friends will start to shift. Friends will quickly turn into acquaintances. I will learn to show just enough, never more, to these acquaintances. They will be sad when I leave them. It happens almost every year. They will feel like they know me. With age, they will understand that they don't. I will search for people with similar stories like mine. These people will remain my close friends. The word home will remain unknown. The word change will become my only constant, and so the word roots will sound like a threat. I will learn that nothing is permanent. I will learn to build walls. THIS IS MOSCOW IN 1989. THIS is my FAVORITE RUSSIAN CARTOON in 1989. THIS is my FAVORITE AMERICAN CARTOON. THESE are the MAGAZINE COVERS in 1989. I will later be horrified when Donald Trump becomes President. THESE are the HIT FILMS of 1989. I will love Uncle Buck. THE SEINFELD CHRONICLES premiers on JULY 5, 1989. I will later watch this with my first serious boyfriend. He is an American. I try to conform. MADONNA releases 'LIKE A PRAYER' in 1989. I will later move to Michigan where Madonna is from. THIS is my FAVORITE SONG. It will later remind me of Vancouver and happy moments spent with my Mom. THESE are my FAVORITE FILMS. I will later substitute Ariel with Alice as my favorite Disney Character. I will later wonder why I spent so much time running from my Russian heritage. I will spend time re-learning my history and my culture. I will wonder how Putin + Russia became the most discussed topics in politics and on the news. I will feel conflicted about this.